Badiou’s recent ascent to superstar status in contemporary philosophy means there is renewed interest in some of his hitherto neglected work, written in the years before he became academic hot property. This volume, The Rational Kernel of the Hegelian Dialectic, was first released in French in 1978, ten years before the publications of Being and Event and Logic of Worlds propelled him into the forefront of critical theory. Beside those two philosophical behemoths, this short work on initial inspection might appear to be a slight and lesser study. Tzuchien Tho, Badiou’s translator, admits that it is a ‘rather strange and singular book’ (89) and the author himself refers to it as ‘really a phantom of a book about Hegel’ (100). 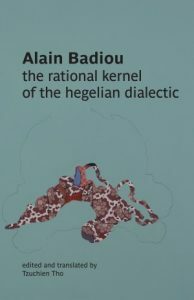 The format of the study is initially confusing as although Badiou’s name is understandably given top billing on the cover , the core of the book is actually an analysis of the Hegelian dialectic written by a Chinese scholar, Zhang Shi Ying in 1972. Bookending this study is a commentary by Badiou and two of his lesser known collaborators from the 1970s. This curious format takes some getting used to and the first-time reader could be forgiven for being unsure at times whether she is reading the words of Badiou, Tho or Zhang. The best known of these three acknowledges the difficulty created by this method: ‘I’m not sure that we can really read it. We might perhaps circulate within it rather than read it.’ (99) Once the reader adapts to this idiosyncratic format, however, the book becomes rewarding both as a significant contribution to a seminal debate within Marxist philosophy and as an insight into the conceptual evolution of one of the major thinkers of our times. Badiou and his co-thinkers persuasively argue the power of contradiction and negation outlined in this work from 1816 is the most progressive aspect of Hegel’s oeuvre. Of the three laws of the dialectic later formalised by Hegel’s successors, contradiction is most crucial. Citing the Logic, Badiou underlines ‘the universal and irresistible power before which nothing can stay, however secure and stable it may deem itself’ (28) .Badiou goes on to explain that what sets the Marxist dialectic apart from the Hegelian is that the former is not resolved in some politicised version of the Absolute Idea but continues even after communism has established itself. ‘Untotalizable difference’ as Tho terms it, would therefore also characterise the transition to socialism (xxiii). A non-teleological appropriation of Hegel’s Logic creates the space for an activist-based Marxism that avoids the mechanical determinism associated with Stalinism. The ‘one divides into two’ slogan which Badiou embraces frequently in the book likewise refers to how a revolutionary regime should embrace ideological tensions within itself and not seek to suppress them. Badiou is insightfully highlighting the necessity of proletarian democracy within such a process but his attempts to detect this in contemporary China are far less convincing. He describes how 1978 was a significant year politically on the other side of the world, as well as in France. That is the year, he argues, the Chinese Revolution began to lose its radical edge and commenced the incremental metamorphosis into the quasi-capitalist colossus that has come to dominate the 21st century global economy. In that year a new generation of leaders attained key positions in the Communist Party and initiated the policies of marketisation and deregulation that would transform the Chinese economy from Maoist centralisation to capitalist diversification. According to Badiou: ‘The coup d’etat in China that would bring Deng Xiaoping to power would play the same role in China as that of the election of Mitterand in France, the rule of Reagan in the United States, Thatcher in England etc’ (88). Badiou’s baleful view of the rise of Deng and the subsequent emergence of sharp class polarisation in China is probably shared by most on the contemporary left but his starry-eyed account of the preceding Maoist era is more difficult to swallow. He contends that Mao is in the first rank of Marxist philosophers and places him above any other theoretician of the dialectic in the twentieth century: ‘I think that in the history of the Marxist aspirations of the 20th century, the Maoist attempt was the most dialectical’ (95); and ‘I absolutely maintain that China in the 1960s and 70s was a space of a singular and irreducible existence of the communist hypothesis which is no longer the case ‘(97). Recent historical scholarship on the unimaginable scale of human suffering during the Mao years –45 million dead according to Yang Jisheng’s book, Tombstone – makes any claim about his philosophical stature seem to be in poor taste. Many on the left would argue the degeneration of the Chinese Revolution began long before the death of Mao, perhaps as far back as the 1920s when Stalin ordered the CCP to look for a cross-class alliance with the nationalists of the KMT. A much later controversy in the CCP attracted Badiou to the core text by Zhang. The Chinese scholar had written his book as a philosophical contribution to the debate in the CCP following the winding down of the mass mobilisations of the Cultural Revolution in the late 1960s. Zhang sought to use Hegelianised concepts such as the ‘one divides into two’ (xvi) to legitimate the frenzied turbulence in Chinese society instigated from above from Mao. Zhang was targeting his explication against the faction that would be associated with Deng and others who wanted to open up the economy to penetration by Western capital. Unfortunately this means that Badiou’s supportive commentary is littered with the shrill rhetoric and sectarian posturing associated with this period of sordid score-settling in the CCP. Badiou states the book is designed to refute ‘anarchistic liquidators’ and to ‘Critique and denounce revisionism and its objective allies, the eclecticism of those who believe themselves to be able to dissect what they have announced as the cadaver of Marxism‘ (3). Closed-minded rhetoric such as this has adversely affected the reputation of the far left for decades and it seems incongruous to discover that one of the most sophisticated radical minds of our times has indulged in it. If the reader is inclined to think this could be overlooked as youthful zeal on Badiou’s part, the problem is he still maintains his grudging support for the regime in Beijing. He is ambivalent about the military suppression of the 1989 Tiananmen Square uprising, arguing we should empathise with the CCP leadership as they were solely motivated by a laudable desire to maintain law and order: ‘we also need to represent the trauma that the Cultural Revolution left for the political figures and well … everyone in China, but in particular the political figures involved, the masses and for the people in the party’ (98). For a thinker who has deservedly acquired a reputation as an articulate and resolute champion of the oppressed, it is disconcerting to see him tacitly condoning the crushing of a vibrant and heroic display of resistance. The one problem I have with this review is the assertion that the young Badiou was guilty of “closed-minded rhetoric… [that] has adversely affected the reputation of the far left for decades and it seems incongruous to discover that one of the most sophisticated radical minds of our times has indulged in it.” Such a criticism seems to emerge from someone who is somewhat ignorant of political movements over the course of the 20th century except in the most vague, academic, and “common sense” understanding inherited from discourses such as “totalitarianism” and other asinine examinations of history that lack any real social investigation. While it is true that sectarianism is a troubling tendency amongst the left, so is the spontaneous “anything goes” position that claims all principled political stances are sectarian. Principled positions that draw lines of demarcation, which is what Badiou was doing at the time, actually result in the emergence of theory and revolutionary movements––this was the case with the Bolshevik Revolution and every significant revolution. Of course we should worry about some of the extreme sectarian demonstrated in marxist cult groups, but simply to dismiss a principled political position about *revisionism* and *anti-revisionism* is even more close-minded than the supposed close-mindedness associated with the young Badiou. I am not sure if the author actually understands the global context from which Badiou’s statement emerged, which was the New Communist Movement wherein an anti-revisionist Marxism-Leninism was put forward in response to the shift in the CPSU’s politics. This position was very principled, even if it went off the rails, and was intellectually stimulating for a whole host of thinkers and activists throughout the world. This anti-revisionism, which is the only thing Badiou is expressing in that quote, was responsible for a high tide of political activity that ranged from new intellectual work to armed movements. While we can find much to critique in the limits of this movement, and how some of the NCM organizations did indeed become sectarian and dogmatic, I think it is somewhat uncritical and maybe unprincipled to find a pretty basic statement about the need for anti-revisionism to be a problem that has hampered the left when, in actual fact, such a politics produced an explosion in revolutionary activity at one point in time that did much more for our understanding of reality than dry marxist academics lamenting the supposed inability for an already divided left to work together––and I say this as a dry marxist academic.